Student Writing in Higher Education is a collection of academic research papers which reflect the work being done in what the editors call the ‘new contexts’ of higher education. By this they mean the writing which goes on in non-traditional subjects such as dance or computer conferencing, as well as the new types of writing such as ‘journals of learning’ and ’empathetic writing’ which are now used in a number of subjects. The essays deal with many of the problems faced by typical students – the unspecified audiences for which they are expected to write; the debate about skills-based writing tuition versus ‘writing in context’; and the new problems created by the collapse of traditional subject boundaries. This chapter should be required reading for departmental heads and anybody with a responsibility for training tutors in marking skills. A chapter on academic writing in the study of dance throws up the fundamental problem that not all subjects make the same types of intellectual demand. Terpsichoreans are allowed to describe their own practice and reflect upon the Self in a way which would be unthinkable in traditional disciplines. The same seems to be true of ‘Reflective Learning Journals’ in anthropology [which includes the example of a Death Journal!] – though at least these have as a primary function encouraging students to think about interdisciplinary studies and ‘map’ their experiences of learning. There’s also an interesting chapter on the new use of computer conferencing, with two Open University courses as examples. This throws up the problems of asynchronous and informal academic discourse, as well as the potentially ambiguous role of tutors, who can act as ‘fellow participants’ or as ‘knowledge holders’. One of the persistent weaknesses of these papers is that they often don’t seem to reach any conclusion or have very much to offer by way of insight. As one contributor observes: ‘I am aware that this chapter has raised questions which have not been answered’. I was also surprised by the amount of heavy signposting – such as a chapter whose final paragraphs begin ‘To conclude this chapter I turn finally to issues of pedagogy…’. The other surprise is that so few – almost none – of the studies actually deal with or quote any of the very subject under consideration – student writing itself. One of the most interesting chapters is – perhaps strategically – the last, in which Barry Stierer describes the plurality of writing demands in the Open University’s MA in Education. It’s interesting that a careful explanation of the pedagogic requirements of a well-constructed course are more interesting than any amount of strangulated theorising about ‘epistemic modality’ and ‘intrinsic and embodied readings’. The editors make it clear that they concentrate specifically on the implications of their research for the work of teachers rather than students. In fact this collection will be of most interest to those in the field of educational research striving to generate publications for the next Research Assessment Exercise. 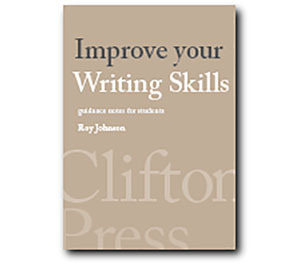 But there are also some practical lessons and observations which might actually help those tutors interested in improving students’ writing skills.